This is a unique tool developed, designed and crafted by Pan60. It is a dual-screen filter with ports arournd the top and sides of the circumference. The intention of this unit is to be used in high SPL (sound pressure level) settings consisting of air gushes or other forms of air movement. The Blast Pad is designed to add protection to the microphone. Over time, high SPLs damage and/or distort ribbon, dynamic and large diaphragm condenser microphones – be it from a kick drum, bass amp, guitar amp, wind instrument, or a powerful vocalist. This unit limits the pressure received by the microphone, ultimately reducing ‘pops’ and unwanted air movement that could ruin an otherwise great take (recording). It not only protects the initial microphone, protecting your valued investment, but also allows the sound to come through to the recording as intended. The Blast Pad is handcrafted. The main body structure is made of corrosion-resistant aluminum, which is anodized for added protection. 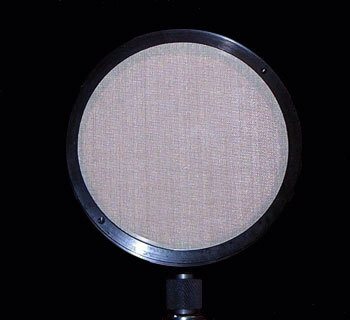 The filter mesh consists of two different-sized corrosion-resistant stainless steel mesh screens. It is a chambered, ported, dual screen design that is easy to maintain with a little cleaning - soap and water to wash, water to rinse and a cloth to dry (or drain dry). It has been designed to last a lifetime. The Blast Pad weighs 5.192 ounces and the circumference is five inches. It contains a four inch opening and six ports with a mount for standard microphone stands or goosenecks. These filters have been field tested by professional recording engineers in numerous settings with multiple instruments and vocals. Their response has been absolutely positive. The main body structure is made of corrosion-resistant aluminum, which is anodized for added protection. The filter mesh consists of two different-sized corrosion-resistant stainless steel mesh screens. The Blast Pad weighs 5.192 ounces and the circumference is five inches. It contains a four inch opening and six ports with a mount for standard microphone or gooseneck stands.